Steiff Belly Rabbit Comforter is hand made in the finest pink cuddly soft plush. 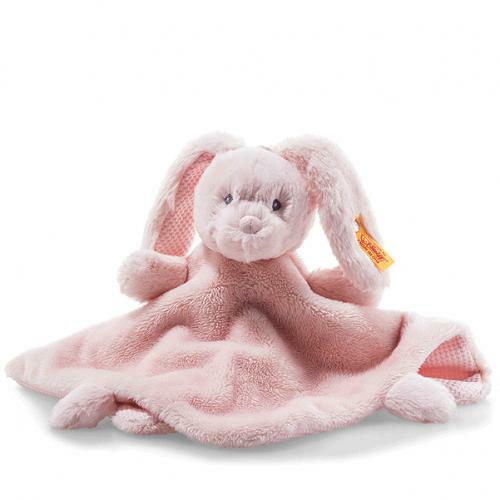 The Soft Cuddly Friends Belly rabbit comforter is the perfect gift on the occasion of a birth, baptism or first visit. She measures 26 cm and is made of pink plush fabric which is ideal for your baby's soft skin. The inside of the blanket, snub nose and inner ears are made of a soft material mix. The soft exterior of the comforter has been intentionally made of a firmer material mix. Her eyes are lovingly embroidered.